ID Keys: Long white stripe on wing, spotted back, stripes on face. Male have red throat, Females have white throats. Not a Warner Brothers cartoon character, but an actual bird. The closely related Red-naped Sapsucker is very similar, but ranges are distinctly different. As the name implies, Sapsuckers drill a series of wells in trees and drink the sap that oozes forth. They are often quite important ecologically for a given habitat, as several other animal species use sapsucker wells for feeding. Male Yellow-bellied Sapsuckers are quite territorial, and can often be heard banging out their territorial drumming. They've come to learn that metal signs and other metal objects can amplify the drumming sound, and thus individual birds may return to a given sign time and time again in order to reinforce their control over a territory. The photo to the right shows a male at a nest hole. Females are similar in plumage but lack the red on the throat. Habitat: Can be found in nearly any kind of forest during migration. Generally in deciduous to mixed forest in the summer. Diet: Other than sap, eats insects attracted by their sap wells. Also eats fruits and berries. 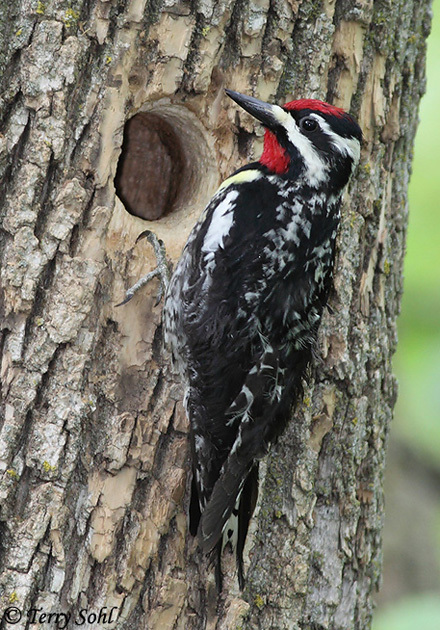 Behavior: While much of the diet may be tree sap, they also often glean insects from branches as do other woodpeckers. They also may catch insects in mid-air. 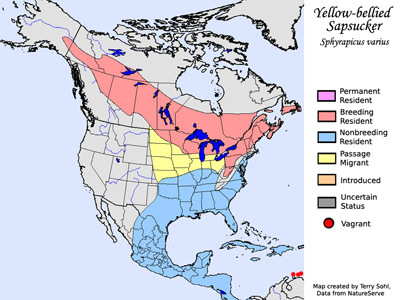 Migration: While most woodpeckers in the United States are not know for long migration, the Yellow-bellied Sapsucker is strongly migratory, wintering in the southeastern U.S. down through Central America, and summering in the northern U.S. and Canada. Feeders: Fruit, will use hummingbird feeders for nectar, occasionally suet. Conservation Status: Populations are generally stable, they are common in many parts of their range, and they are found over a broad geographic area. The IUCN considers the Yellow-bellied Sapsucker to be a species of "Least Concern". Additional Photos: Click on the image chips or text links below for additional, higher-resolution Yellow-bellied Sapsucker photos. South Dakota Status: Uncommon migrant and summer breeder in the far eastern part of South Dakota. Becoming increasingly rare as a migrant as you move westward in the state.